I love reusing everyday materials to save money and tread lighter on the planet. Wood pallets are a free resource available at many business and industrial sites. 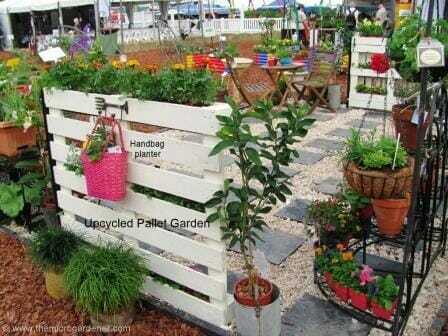 I upcycle pallets for all sorts of garden projects, from mini garden storage units to compost bays and planters. 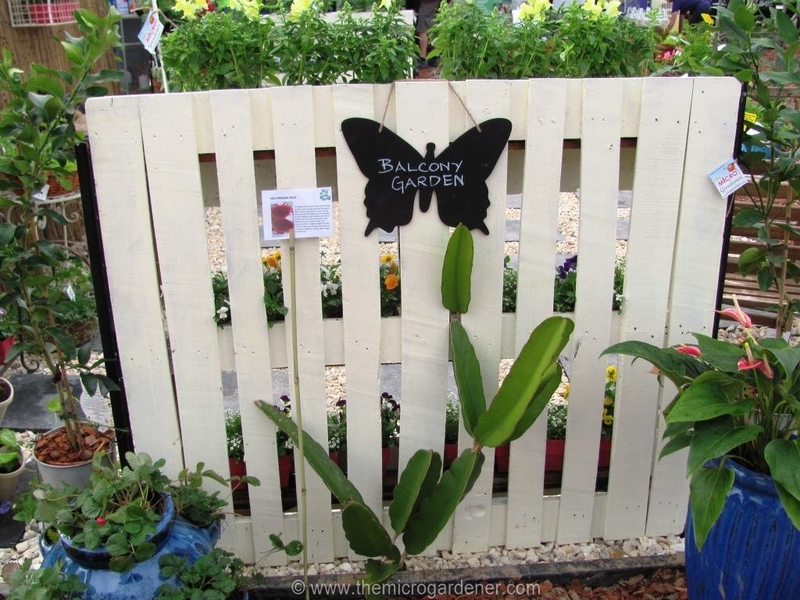 For this year’s Balcony Garden display at the Queensland Garden Expo, I salvaged a couple of timber pallets from a local organic farm and gave them a face lift for new life outdoors. They formed two side ‘walls’ in the display. I plan to now reuse them at home as they are so versatile. On the front are six window boxes for pots + hooks for hanging and on the back, a vertical fence – again with opportunities to attach more planters or hang items like garden art. This pallet planter is easy enough for any of us girls to revamp too. 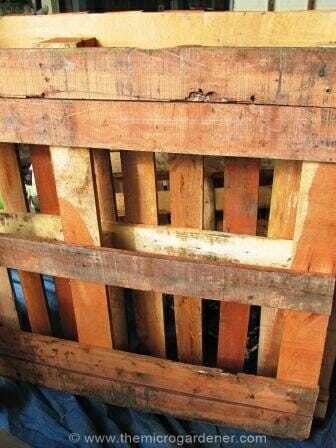 Clean Pallet – in new or as good condition as possible (heat-treated rather than chemical) – See tips at the end of the post on 20 Creative Ways to Upcycle Pallets in your Garden for what to look for. Sandpaper for any rough edges if needed + a pair of gloves. Hammer and a few 2.5cm (1 inch) nails. 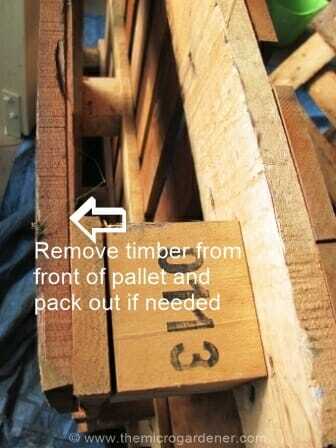 2-3 extra timber palings from another pallet for shelves (cut to size if needed). Drill (optional and easier for pre-drilling holes if you have one but you can use the hammer instead) and a screwdriver. Non-toxic paint in your colour choice (preferably enviro-friendly low-VOC). Or timber stain and a medium sized paint brush. (Optional) depending on your situation, you may also want 2 steel star pickets or stakes and 4 screws (2 for each side) to support the pallet vertically either end. Patience (that’s for the painting part!!) or rope your kids or significant others in to help! It took about 1 hr to paint one coat on both sides for a good finish. Glass of bubbles to celebrate your achievement! Take a good look at your pallet when choosing it. Each one is made differently and some lend themselves to this project more than others. This is what mine looked like on the underside. Left: This pallet had 2 horizontal palings at the top/bottom and one in the middle. Right: When painted these are the front of the planter. On the other side it had vertical palings so looked good as a ‘fence’ or side wall. 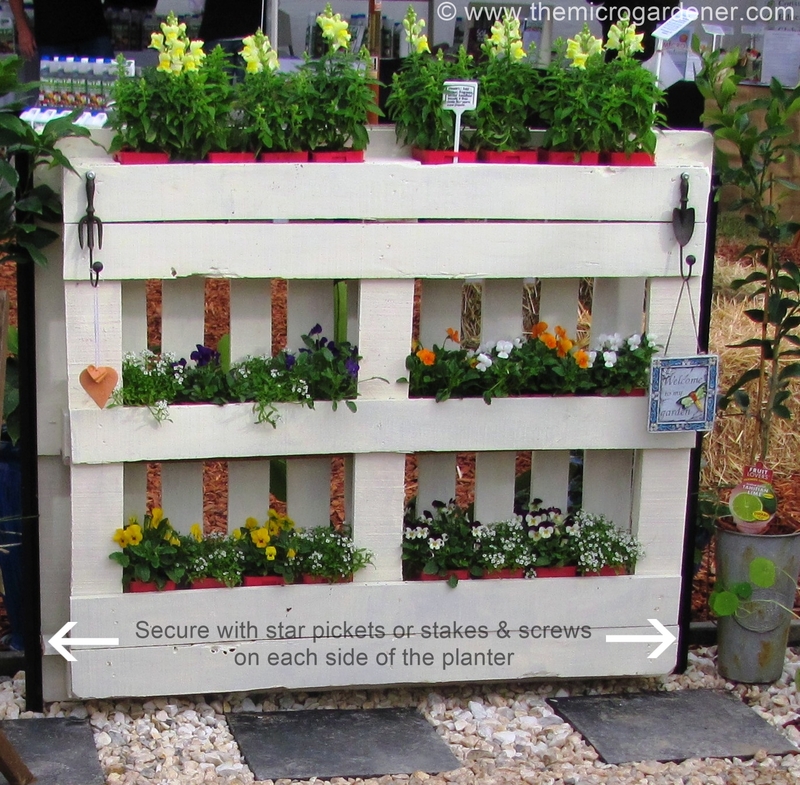 The pallet planter is supported by 2 long lasting black coated steel star pickets driven into the ground alongside the planter + 2 screws into the pallet timber. STEP 1: Check the width of your potential ‘planter boxes’ on each tier of the pallet. My pallets were about 100mm (4 in) wide. 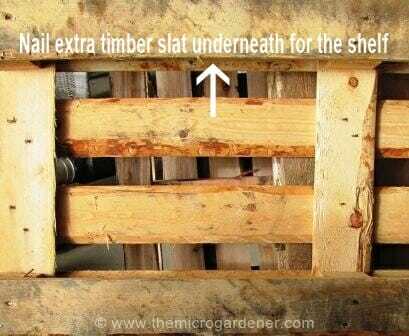 If you want them wider so you can slot in a rectangular pot rather than making a shelf underneath, then you may need to remove the front timber slat and pack out the timber to make it the width you want. I didn’t need to do this but it’s an option. STEP 2: Add a timber paling as a ‘shelf’ for each planter ‘box’ by nailing it to the underside. I just used a hammer and nails for this. Measure the timber so it is the same length as the pallet, but not as wide so there is a gap along the edge for water to drain (see below). 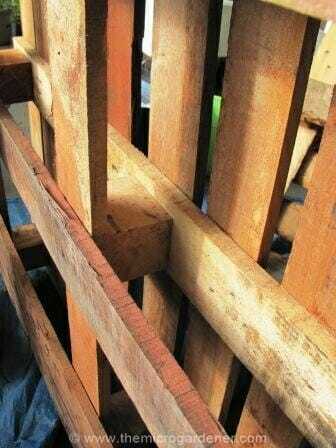 Position timber slat underneath to form a shelf on each tier of the pallet. Nail the slat in place. 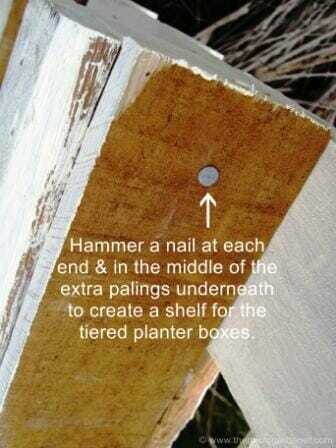 Hammer nails up underneath to secure as shelving. Allow a gap for drainage. 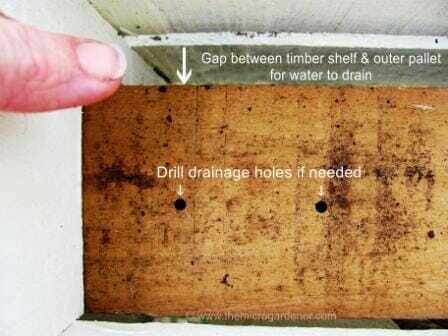 You can also drill additional drainage holes in the timber planter box base if you wish. STEP 3: Prepare the timber. If there are rough edges you may need to grab the gloves and use sandpaper to smooth these off and prevent splinters. I like a rustic look so don’t mind if the wood isn’t perfect but if you want to, you can fill holes or gaps with a timber putty or filler. Sand any rough edges where necessary before painting. 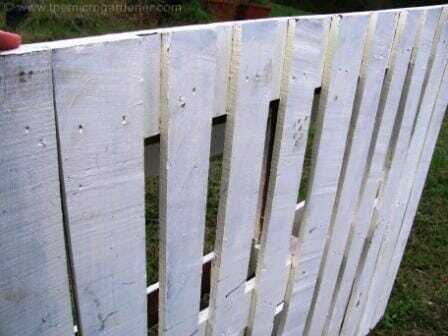 Next, your pallet is ready for painting or timber stain depending on your personal taste and budget. The pallet was sanded & brushed down ready for painting. Remember when choosing paint or tint, pale colours reflect light and dark colours absorb it. If you live in a warm climate, painting your pallet black may not be the best choice. Here in the subtropics I chose cream. It looks classy and was a nice backdrop for the black decorative hooks and butterfly chalkboard I wanted to hang. Even though it will take a little longer, a prep coat and top coat of paint will give you a longer lasting planter. Shelves added to the 3 tiers and outside of planter is painted. 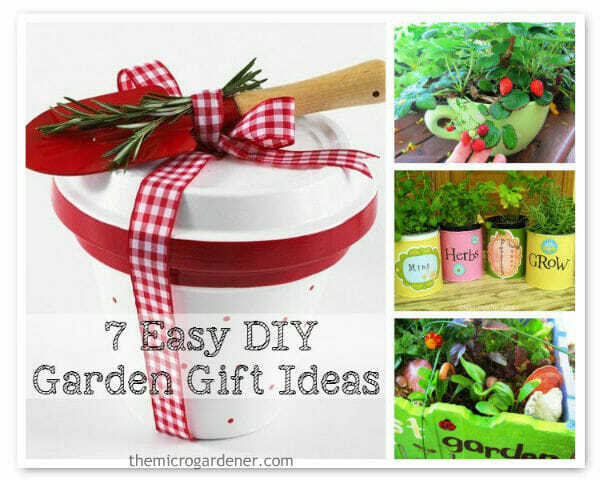 STEP 4: Next up you’re ready for the fun part – adding your pots, plants and decorative items. 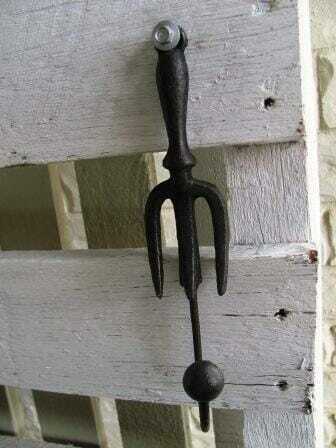 A couple of decorative garden tool hooks were added next. STEP 5: Position your pallet in place. If it needs support in the ground, use the star pickets or stakes. Otherwise, you can add some additional T-pieces of timber as feet supports and perhaps secure to your balcony with zip ties. 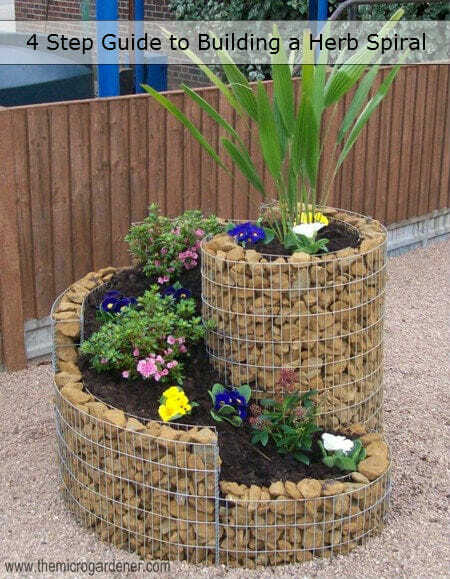 Or secure to a planter box with more weight at the base. Add your favourite plants and water in. Time to position your planter on your balcony, deck or in your garden. You will need to consider where your water will drain underneath the planter so perhaps add a drip tray with gravel. 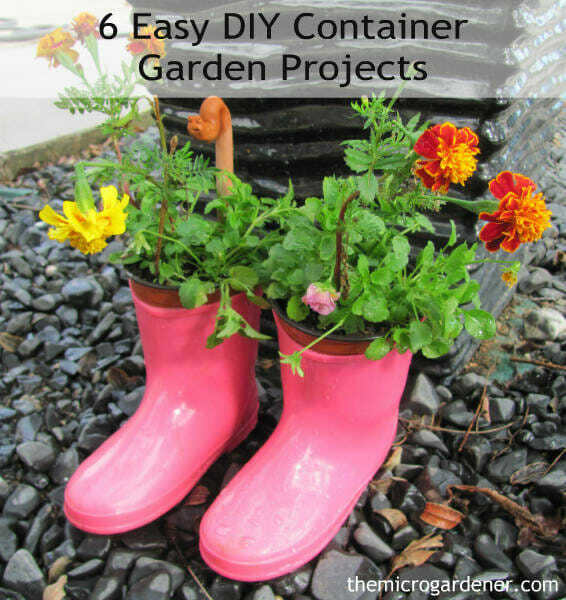 Love DIY and want to learn to grow in containers? Need a quick start guide? My eBook makes it easy + fun. 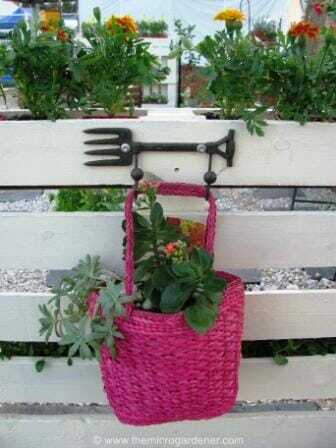 I hung a repurposed handbag as a planter for a bit of colour and fun. 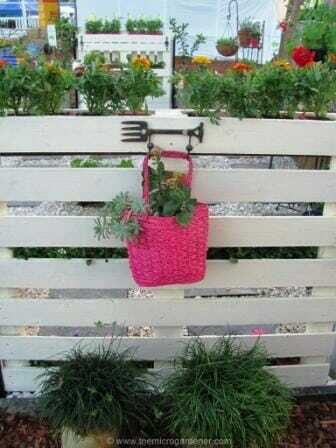 Upcycled handbag planter hanging on the pallet garden. 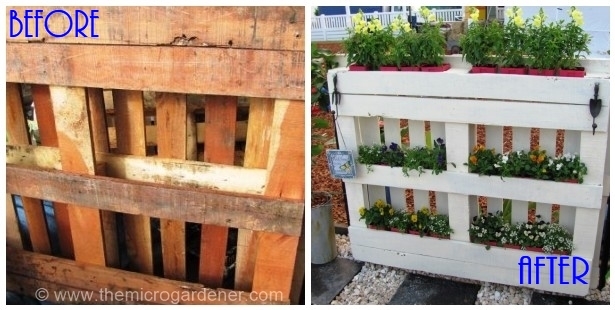 Looking at the garden with both pallet planters. 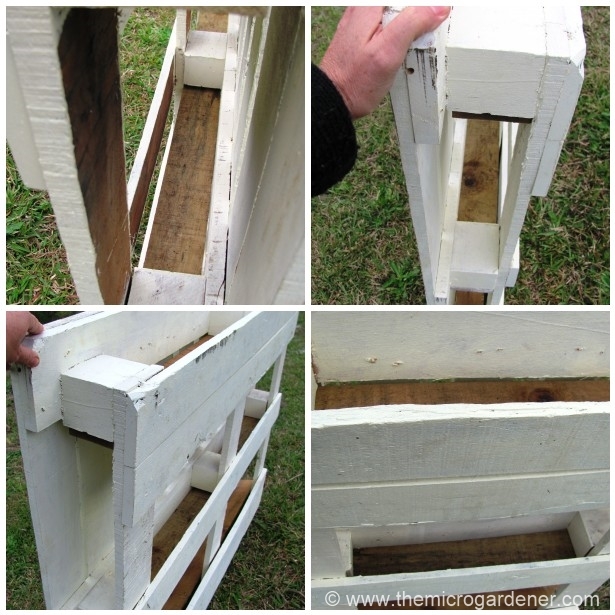 Well, I hope you’re inspired to have a go at making your own Pallet Planter using this tutorial. Just discovered your site. Thank you for sharing so much great information. I could spend hours just reading all the fantastic tips and ideas. Where did you find the adorable little hooks in the garden motif? I LOVE them!!! Would like to make one of these for my yard. Can’t wait to check out the other ideas….. This looks amazing! I imagine for a balcony you could set it up so the back of the planter has a hanger and can be hung on the balcony walls themselves, though that would require some handiness. Tying the back of the pallet onto a bar type balcony with chain or lots of twine could also work, but it sounds like you don’t have that. Anyways, this project is awesome, I’ve been searching for better uses for pallets besides firewood and a coffee tabletop (with legs and a piece of wood or slab of stone/concrete on top), and this just might do the job. I’ll have to look into it! 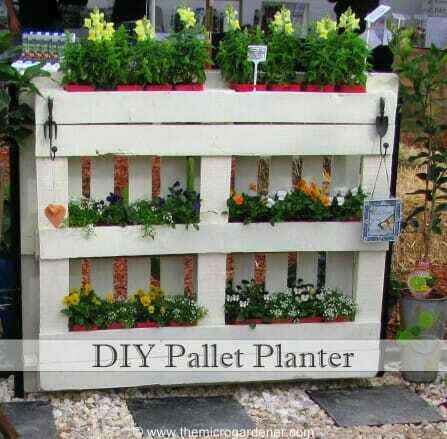 What a pretty way to use a pallet! We have a shaded patio under our balcony, and that is exactly where a couple of these will go this summer. I love gardening! We moved to an acreage ten years ago; it was basically a cow pasture, but we rose (pun intended) to the challenge of amending the soil for flower gardening. Thank you for sharing your tutorial! I will be linking up to your blog. 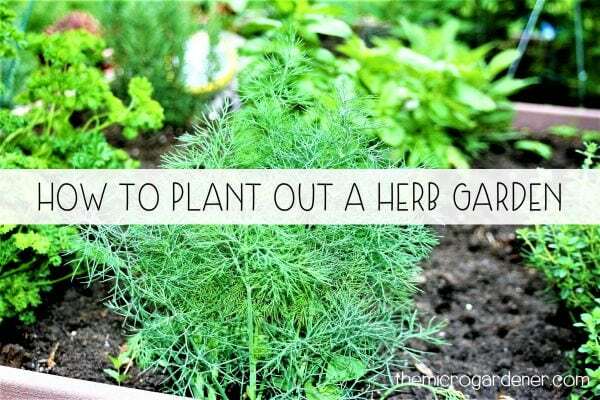 This was shared on facebook and I liked It so much I just had to copy the instructions down and save them to my computer to use next spring when we move our Mobile Home onto our own lot. 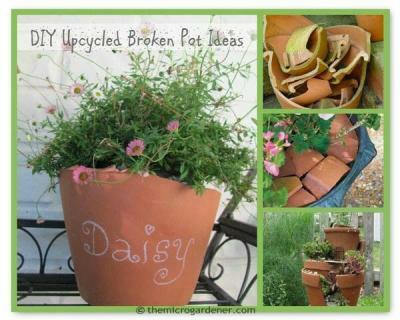 This is a terrific idea and looks great! I’d like to make one for my balcony. Any thoughts on how to keep it from toppling without being able to sink supports into the ground or drill into walls? I have a sunken terrace surrounded by brick walls. Perhaps simply leaning it would work?